The wheel house is standard and practical for good piloting of a large barge. The main day room is aft and three steps down from the wheelhouse and consists of a well equipped galley incorporating an eight place dining/breakfast table. Immediately to stern of the galley is the heads with electric toilet and a bath. The living quarters is forward down a corridor and the first room to the left is the master cabin followed by a large furnished, air-conditioned dining room and saloon with a feature fireplace and large wood- burning insert fire. Forward there are another four single berth cabins and a large store room. Another double cabin designed as crew's quarters and further space for storage is accessed from the deck though hatches on the foredeck area. 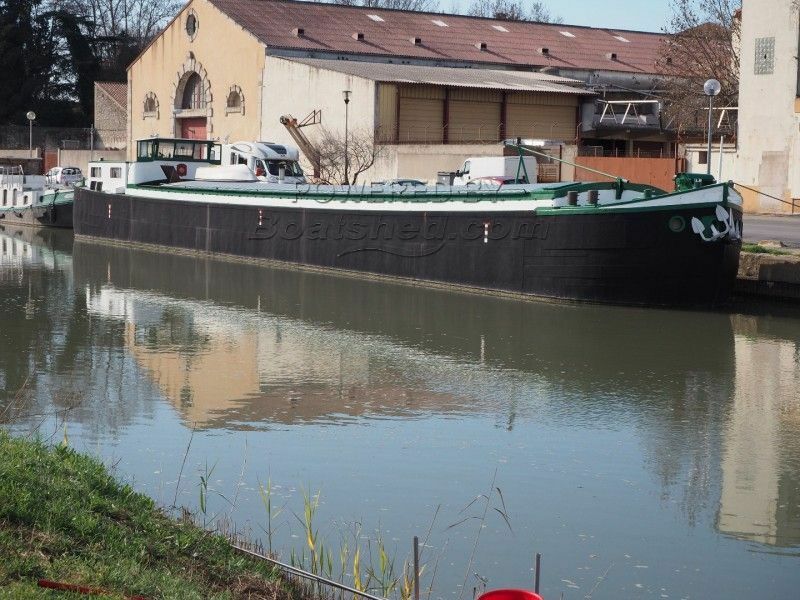 Residential barge for sale in the Midi region of France. Boatshed Midi Canals is pleased to offer this 38m barge converted to spacious live aboard vessel. An unusual conversion suitable for a large family and immaculately maintained by her present owners. Just look at the photos. An engine room as clean as the lounge and visa versa. For more information and appointments to view, please contact Graham WHARMBY, your Boatshed broker from Boatshed Midi Canals. This Peniche Freycinet Live Aboard Barge has been personally photographed and viewed by James HEBDEN of Boatshed Midi Canals. Click here for contact details.